We make traditional and contemporary stringed instruments — mandolin family (mandolins, mandolas, citterns, bouzoukis), fiddles (violins) and violas, guitars and, occasionally, ukuleles. Prices vary according to the materials used, the fittings and the amount of work involved. We can arrange to fit pickups to our new instruments (no charge for the fitting); please contact us to discuss your requirements. Many of our instruments are made on commission, but we usually have a number in stock. If you'd like to try an instrument before you buy, the easiest way is to pop by our stall at a festival or event (listed on the 'How to buy' page) or visit our workshop in north Northumberland (strictly by appointment only; please contact us for details). Often, some of our instruments are on sale at music shops (see 'Stockists' on the 'How to buy' page). To find out what we're making and doing now, click here for our latest news. 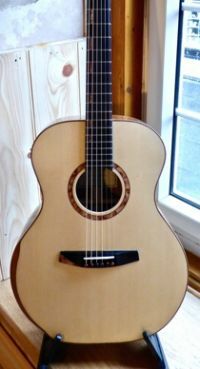 Each instrument is unique and entirely hand-crafted from timber selected for its appearance and tonal qualities. We acquire our timber in small batches from reputable sources that place sustainability at a premium and, where possible, use British timber (see Environmental Policy). We never import part-made instruments to finish! 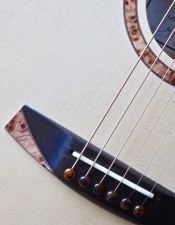 We use high-quality fittings such as German-made Schaller machine heads, and try to support other local businesses— for example, our mandolin tailpieces are specially made for us near Newcastle. 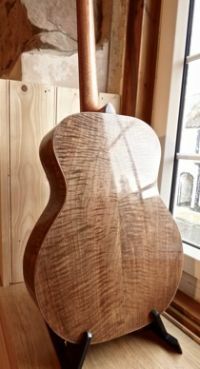 The combination of the wood, fittings and, of course, the skill and techniques used in the making, ensure that the instruments look and sound great. 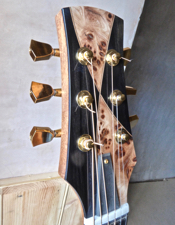 We also undertake repairs to stringed instruments. 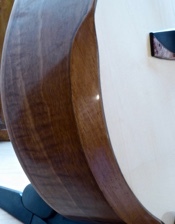 Please contact us for a quote if your instrument needs attention. We are a partnership — Mark and Sue Mawby. Mark makes the instruments and, as a musician (he can play all the instruments he makes), understands your needs as a musician — whether you're a professional looking for a bespoke instrument or a beginner. Sue does all the other things necessary to keep a small business going, and sometimes helps in the workshop. If you'd like to know a bit more about us, click here. Small Strings website last updated on 15 April 2019.